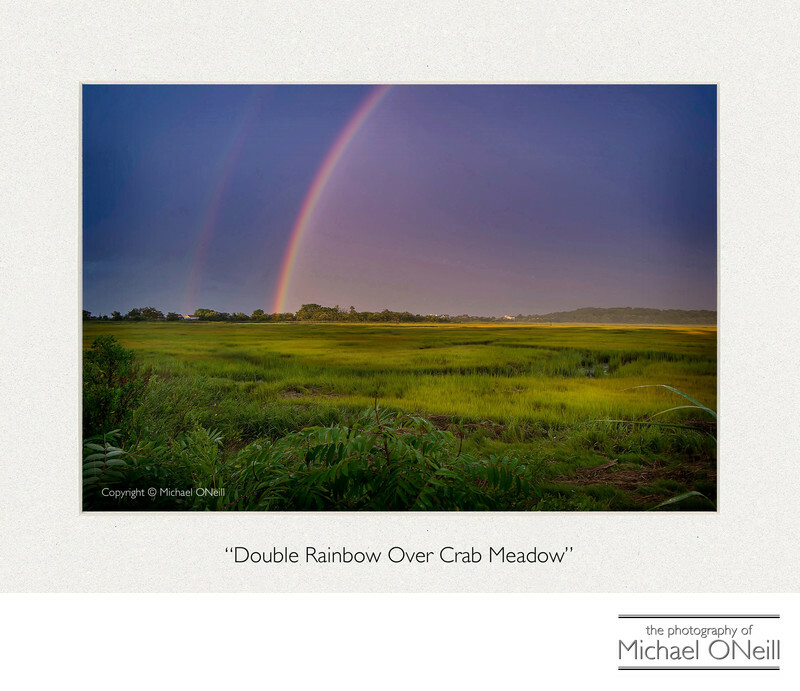 "Double Rainbow Over Crab Meadow". I’m not sure exactly how Crab Meadow got it’s name. Webster’s dictionary defines a meadow as: 1. A tract of grassland used for pasture or serving as a hayfield or 2. A tract of grassland in an upland area near the timberline. Crab Meadow is neither of these. It is a tidal estuary off the Long Island Sound and it happens to be located right at the end of the street where I live. I actually reside in what is known as the Crab Meadow section of Northport, NY. Pictures of rainbows are usually quite serendipitous in nature...the photographer being in just the right place at just the right time. I could see this image coming however. It had been raining for what seemed like weeks and the sun started to break through the fast exiting clouds in very close proximity to sunset. I grabbed my camera, headed down to the "meadow" and waited for Mother Nature to do her thing. It didn’t take long. Five minutes later I was back home with this image in my camera. This is one of my fine art images that was created with one of the new breed of mirrorless compact cameras...in this case the Fuji X-T1 camera body fitted with the 18-55mm f2.8 Fujinon X-Series lens. These cameras are revolutionizing location photography by offering quality equivalent to a DSLR camera in a package that is 1/3 the size and 1/3 the weight. There is no excuse for not having a camera at your disposal at all times since these marvels have hit the market.